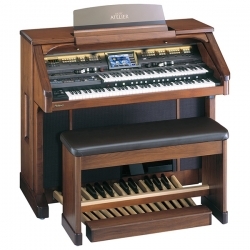 The AT-900 organ console is the genuine article, crafted in America from seasoned natural wood. The gorgeous cabinets are adorned with notable features, including gentle illumination, a sliding music rest, and a large LCD color touch-screen. The visual beauty of the flagship Atelier is matched by the magnificent sound that Roland is world famous for. It’s a true delight for the eyes, ears and fingers.